Terry Garthwaite performs on Sunday, Sept. 16, at Sebastopol Community Center, 390 Morris St., Sebastopol. 4pm. $25–$30; premium seating and album, $60. seb.org. BIRTHDAY GIRL Terry Garthwaite’s throwing a party! 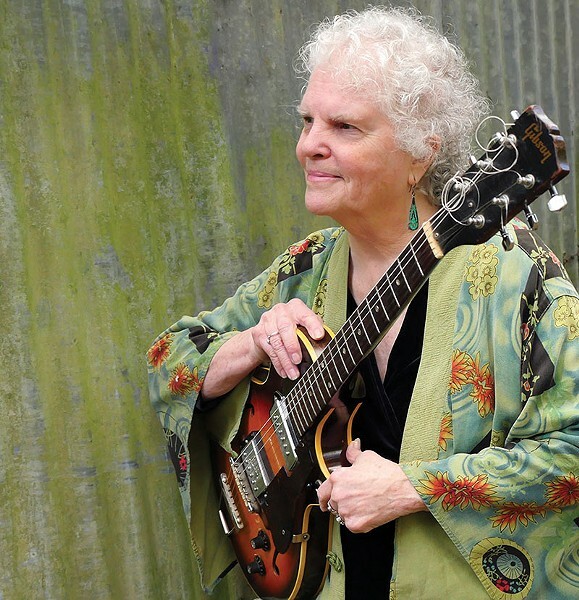 Internationally known singer-songwriter, producer and teacher Terry Garthwaite has lived a life of music that dates back to the late 1960s, when she co-formed and fronted Berkeley rock group Joy of Cooking. "The album came out last year, but I never did a release party," Garthwaite says. "And I just turned 80, so I decided, OK, I'm going to celebrate the fact that I'm still making music." Garthwaite's first release in over a decade, Shine On features 19 tracks that span her songwriting career, including tunes originally written in the 1970s as well as brand-new compositions. "I just don't stop writing songs, so I had a lot of new stuff to put down," says Garthwaite, who recorded the album at Sebastopol's Studio E.
Garthwaite's 45 years living in West Marin is reflected in many of the songs, and all of her tracks feature positive messages, a staple of her songwriting since the beginning. Dating back to her time in Joy of Cooking, who regularly opened for headliners like Van Morrison, the Band and the Grateful Dead at venues like the Winterland Ballroom in San Francisco, Garthwaite says music was always a joyous experience, "with people dancing because the rhythm was compelling and the lyrics were uplifting—that's where I like to go with my music," she says. Garthwaite also uses her music as a teaching tool, leading songwriting workshops such as her annual Women Singing in Circle retreat, where she joins singers like Threshold Choir founder Kate Munger for a weeklong outing in the mountains of New Mexico. "It's a perfect environment for my songs, a lot of people who come to the retreat need songs of comfort and joy," she says. This month's birthday concert will be another joyous experience, as Joy of Cooking bassist David Garthwaite (Terry's brother) and drummer Fritz Kasten join Garthwaite, along with her favorite guitarist Nina Gerber, Studio E owner Jeff Martin, vocalist Chris Webster and others. "I wanted to have a mix of musicians on the show," Garthwaite says. "There's going to be a real feeling of community onstage."